Join the Coburn Art Gallery on the Ashland University Campus for Summer Art Camp, which offers an intensive and creative one-week session on June 17-21, 2019. 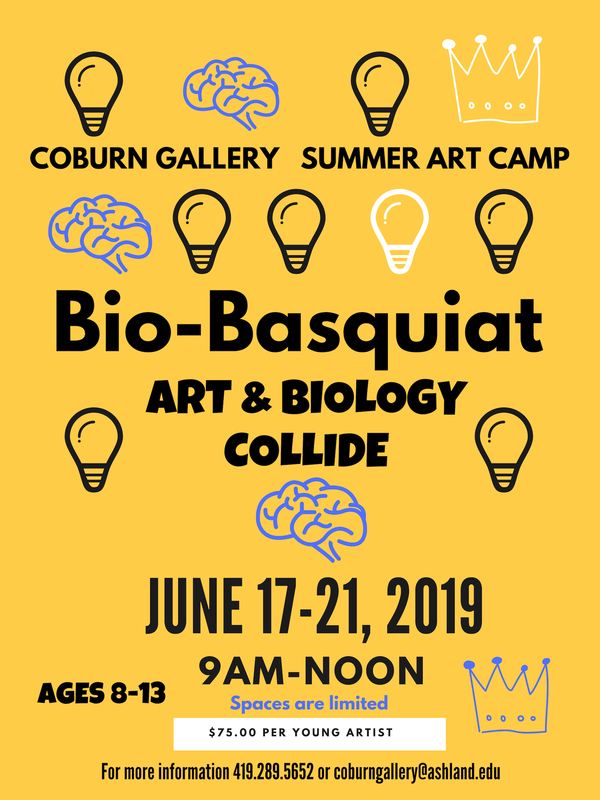 Art & Biology collide in this fun filled mixed media camp week. Art Camp is for young artists ages 8-13 and runs from from 9am-12noon. The camp ratio is 1:6. Summer Art Camp session fee is $75.00 per child. All materials are provided. Enrollment is limited. Registration and payment due prior to the class date to ensure spot in the event. For more information or to register your child for summer art activities, call 419.289.5652 or email coburngallery@ashland.edu. The Coburn Gallery serves as Ashland University's primary resource for the viewing of visual art by the academic community as well as by the general public. These exhibitions form the visual foundation of the educational mission of the Department of Art. The gallery schedule focuses on the work of nationally known contemporary artists as well as Ashland University art faculty and students. Every year the Coburn Gallery hosts the Faculty Exhibition, the Student Exhibition (juried by an outside juror with cash awards for outstanding work), the Senior Exhibition (featuring the work of graduating seniors) as well as The Ashland Exhibition, a juried summer event displaying the work of area artists. The Fall semester usually features the work of artists from across the country, as well as themed exhibitions. With its ample proportions, comfortable feel and excellent lighting, the gallery provides a space where all members of the campus community may enjoy the beauty and stimulation of the visual art experience. 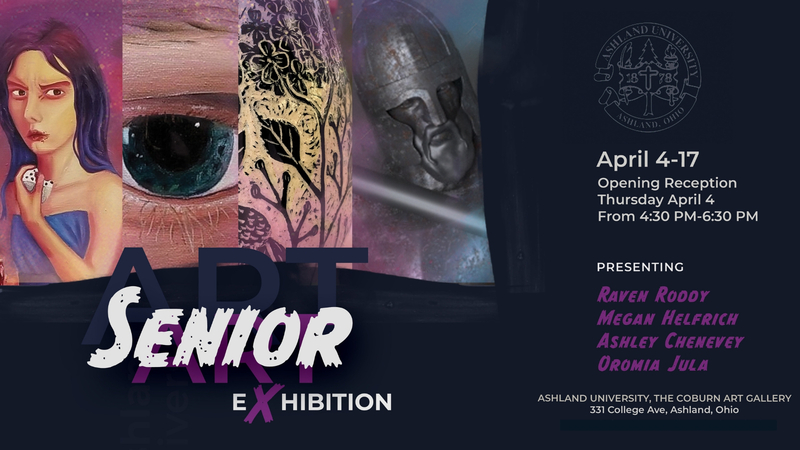 Each spring, the Ashland University Coburn Gallery hosts the Senior Art and Design Exhibition that features the capstone experience for graduating art majors. Bringing together artwork made by graduating seniors in the Department of Art and Design , the 2019 Senior Art and Design Exhibitions will open on Thursday, April 4 and Tuesday, April 23, with an opening reception from 4:30 to 6:30 p.m. on each perspective date at the Coburn Art Gallery located in the Center for the Arts on the Ashland University campus. The senior art awards will be announced at 5 p.m. at the April 23 reception. This year’s exhibitions, which will run from April 4 through May 4, include graphic design, illustration, digital art, painting, and ceramics. Senior Art & Design Exhibition I artists - Ashley Chenevey, Megan Helfrich, Oromia Jula, and Raven Roddy. Senior Art & Design Exhibition II artists - Cait Davis, Sage Haines, Allison Montgomery, Michaela Ping, Madeline Rogowski, and Kiana Ziegler. 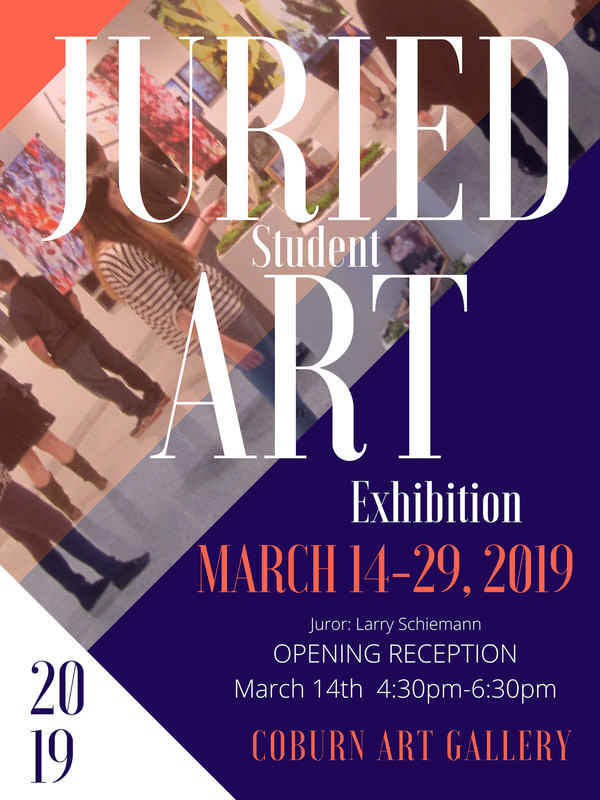 The Ashland University Juried Student Art and Design Exhibition opens on Thursday, March 14, in the Coburn Gallery with a reception to be held from 4:30 to 6:30 p.m. This exhibition, which runs from March 14-29, will offer $550 in awards to student artists, including Best in Show, Bernini Award, Dean’s Award, AU Permanent Collection Award and the People’s Choice Award. The awards ceremony will begin at 5:30 p.m. on March 14. The annual exhibition represents a culmination of student work from university art classes during the school year. It is an opportunity for art students to take their best artwork from the year, learn how to professionally present it for display and then receive feedback from an outside art professional. The outside juror for the exhibition is Larry Schiemann, a longtime Ashland University Art Department faculty member and currently the owner of Clayfields Pottery that specializes in works of stoneware and porcelain clay. Schiemann has exhibited nationally and has offered many ceramic workshops throughout his career. Schiemann is represented by galleries in Michigan, Ohio and Florida. The exhibition is an excellent opportunity to support the arts by purchasing a student artwork, whether you are just starting to collect art or adding to a collection. A generous donation from Dr. Wendy and Scott Schaller, Dr. Dawn Weber, AU Permanent Art Collection and other private donors has allowed the University to offer several of these awards. The Coburn Gallery is open from 10 a.m. to 5 p.m. Monday-Friday and 12 noon to 4 p.m. on Saturday and Sunday. For more information on this exhibition, visit www.ashland.edu/coburngallery, find us on Facebook or call 419.289.5652. 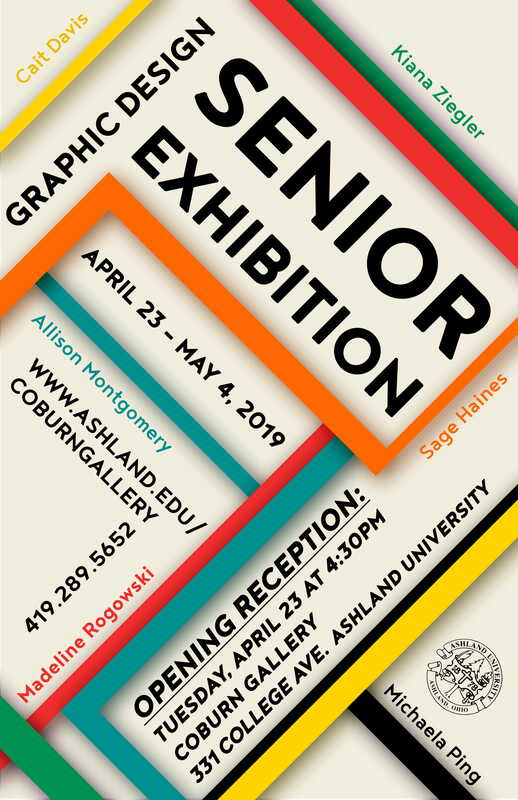 In late November, the Ashland University Coburn Gallery will host the Senior Art Exhibition that features the capstone experience for graduating art and design majors at AU. Bringing together the artwork made by graduating seniors in the Department of Art and Design, the Fall 2018 Senior Art Exhibition will open on Thursday, Nov. 29, with an opening reception from 4:30 to 6:30 p.m. at the Coburn Art Gallery located in the Center for the Arts on the Ashland University campus. 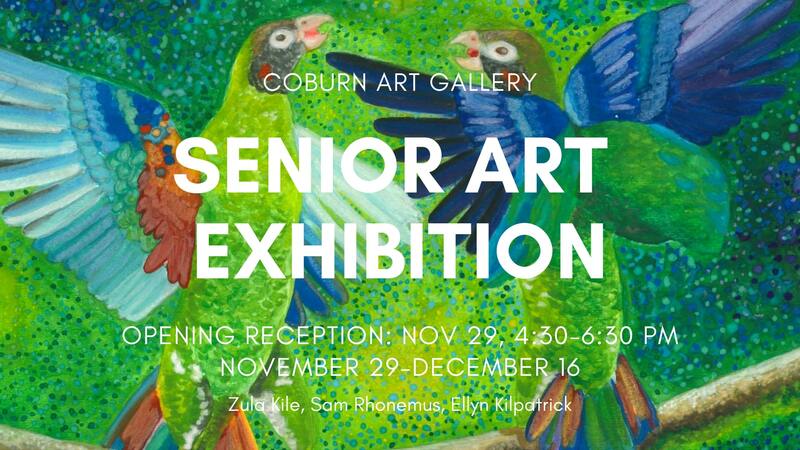 This year’s exhibition, which will run from Nov. 29 through Dec. 16, includes digital art, painting, printmaking, graphic design and sculpture from three Senior Art Exhibition artists - Samantha Rhonemus, Ellyn Kilpatrick and Zula Kile. Ellyn Kilpatrick, from Rocky River, Ohio, will be graduating this December with a Bachelor of Arts degree with a Fine Arts concentration and a minor in Art History. The youngest daughter of Russell and Pamela Kilpatrick, she is a part of the theatre academic honorary, Alpha Psi Omega, as well as a part of International Club and Art Club. Kilpatrick has exhibited work in two Juried Student Art Exhibitions and was the featured artist at Clague Playhouse in May 2018. After graduation, she plans to move to South Korea where she intends to continues her education and tutor English. Samantha Rhonemus, from Bluffton, Ohio, will be graduating in May 2019 with a Bachelor of Arts degree in Fine Arts and a Bachelor of Arts degree in Commercial Art. The youngest daughter of Michael and Tenna Rhonemus, she is part of the sorority Theta Phi Alpha and Art Club, were she has held numerous positions like vice president, treasurer, and apparel chair in both organizations. Rhonemus has exhibited work in four Juried Student Art Exhibitions where she was awarded The Best in Show Award, as well the 3-D Award. She also was featured in the M.A.D.E in Ashland Art Exhibition, and was a finalist in the Photographer’s Forum where she was published in the annual book that is produced. After graduation, she plans to find a job that can lead to her owning her own business someday, where she can create personalized art and continue her love for photography. Zula Marie Kile will be graduating from Ashland University with a Bachelor's Degree in Fine Art, with a concentration in Painting and minor concentration in Digital Art and a minor in Philosophy. She was born in the village of San Pedro Columbia, Belize; and her artwork features scenes from her tropical home. She is a member of the Art Club, Philosophy Club and Phi Sigma Tau, the Philosophy Honor Society. After graduation, she intends to return to her native country. 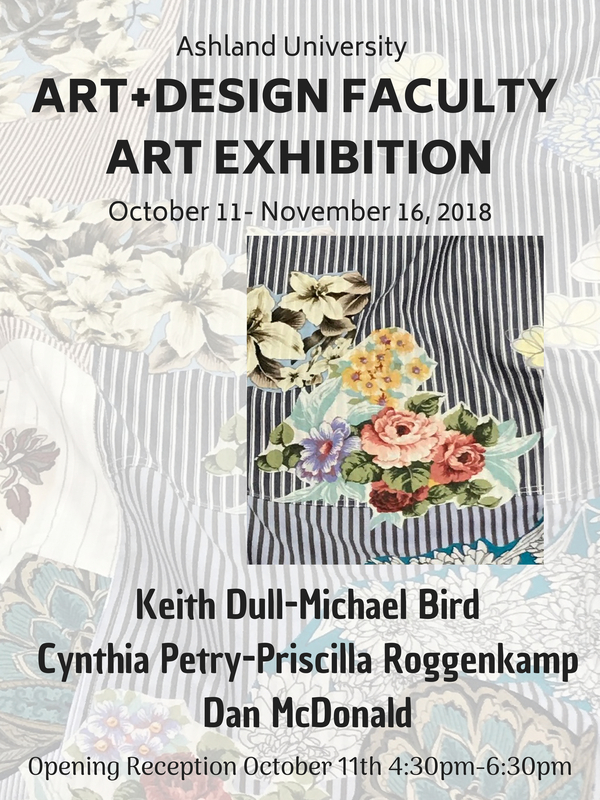 The AU Coburn Gallery has scheduled an upcoming art exhibition featuring the works from the Ashland University Art and Design Department faculty. The exhibition opens on Thursday, Oct. 11, and runs through Nov. 17, 2018. 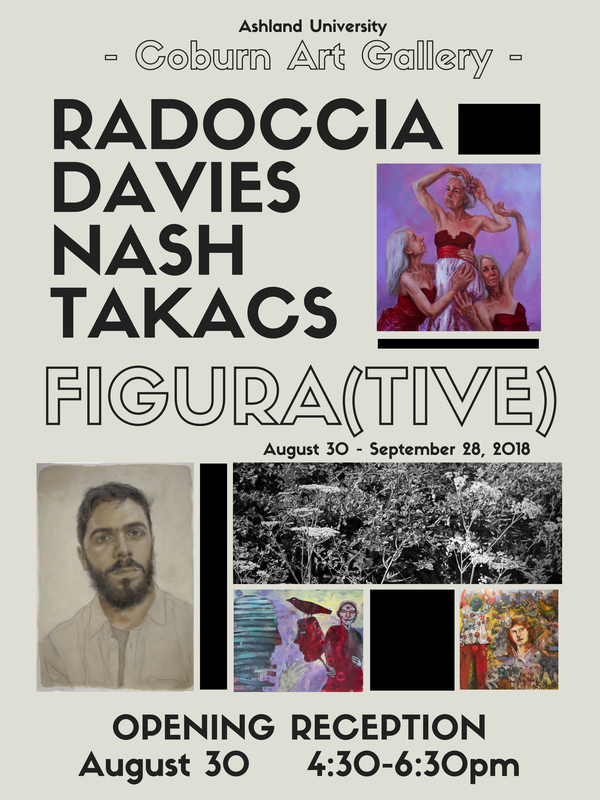 The exhibiting artists include Benjy Davies, Beth Nash, Joe Radoccia and Judy Takacs. 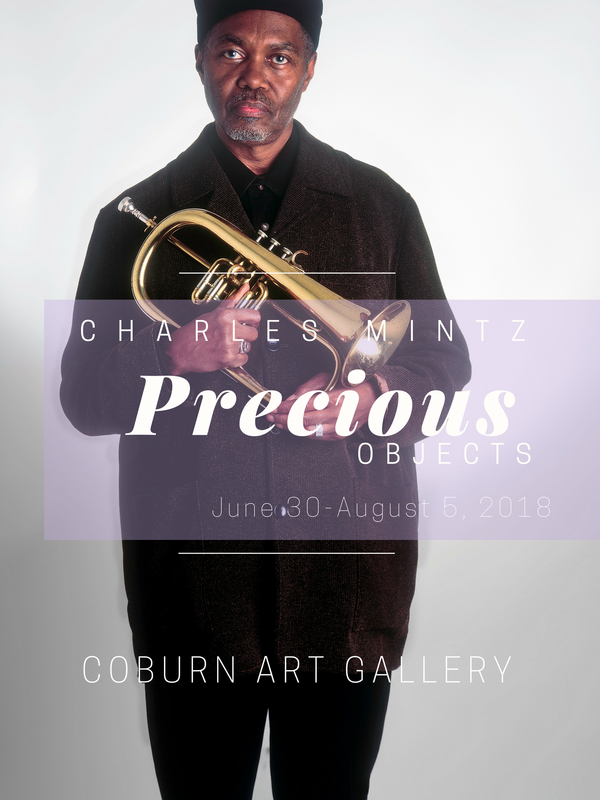 The Coburn Gallery at Ashland University will host an exhibition titled “Precious Objects,” which will display 20 paired photographs featuring the portraits of the sitters holding their self-chosen precious objects alongside a full-size copy of handwritten statements explaining their choice, all created by Ohio photographer Charles Mintz. The exhibition will run from June 30 through August 5 and a closing reception is planned for Sunday, August 5, from 2 to 4 p.m. During the closing reception, the gallery patrons will have the chance to meet Mintz. The “Precious Object” project began with a focus on Mintz wanting to compare these selected items to contemporary consumer objects. Mintz’s view returns in the curated selection of these subjects. According to Mintz, the project has a remarkable duality between the written statements and the appearance of the portrait. “I was humbled by the stories of the 170 people in this project. Loli’s letters written by the mother she never knew, Trevis’ inmate card from 25 years ago and his current library card, and Grace’s lovely little stuffed dog who survived her scarlet fever all represent the subject’s courage and generosity in coming forward with their stories. While all three are challenges I never faced, they give life and perspective to the one’s that I have,” he explained. Photography, which is Mintz’s third career, is the result of a passion acquired in Maine many years ago. Most of his work is done on film -- at least it begins there. The monochrome is printed in the traditional darkroom, the color scanned and printed on inkjet printers. He no longer prints color in the darkroom although the experience in color and contrast management strongly affects how Mintz’s prints digitally. Mintz’s education includes study at Parsons School of Design, International Center for Photography, Maine Media Workshops and Cuyahoga Community College. Mintz is the recipient of two Ohio Arts Council grants and he exhibits regularly on a regional, national and international level. The gallery is open from 10 a.m. to 4 p.m. Monday through Friday and 12 noon to 4 p.m. on Saturday and Sunday and admission is free and open to the public. For more information about the reception or exhibition, call 419.289.5652 or visit us on Facebook. Saturday & Sunday noon-4 p.m.
Closed during university breaks and hoildays. Aug. 30-Sep. 28 | Opening Reception: Thu., Aug. 30, 4:30-6:30 p.m. Opening Reception: Thu., Oct. 11, 4:30-6:30 p.m. Opening Reception: Thu., Nov. 29, 4:30-6:30 p.m.
Jan. 24-Feb. 23 | Opening Reception: Thu., Jan. 24, 4:30-6:30 p.m.
Mar. 14-Apr. 5 | Opening Reception: Thu., Mar. 14, 4:30-6:30 p.m. Opening Reception: Thu., Apr. 11, 4:30-6:30 p.m.
Senior Art + Design Exhibition I artists - Ashley Chenevey, Megan Helfrich, Oromia Jula, and Raven Roddy. Opening Reception: Thu., Apr. 23, 4:30-6:30 p.m.
Senior Art + Design Exhibition II artists - Cait Davis, Sage Haines, Allison Montgomery, Michaela Ping, Madeline Rogowski, and Kiana Ziegler. Opening Reception: Fri., May 17, 6-7:30 p.m.